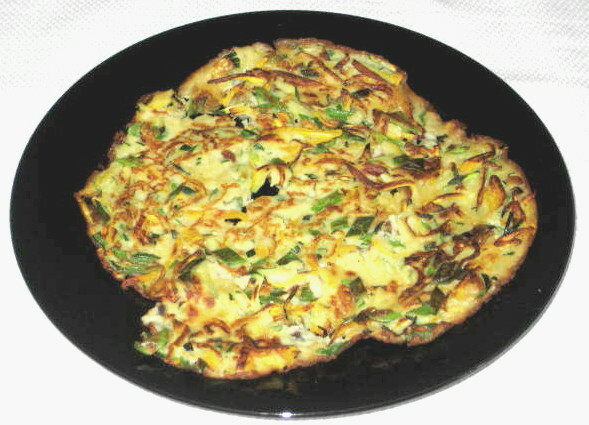 Last few days I had cravings for potato pancakes (or Čmunda in Czech) but it is a winter or cold weather meal. While browsing through other food blogs I came across zucchini version and since I bought bunch of zucchinis at local farmers market my plan was formalized. There is nothing like eating local and in season, right? This pancake is great for nice quick lunch and can be eaten hot or at room temperature. My version is based on recipe from Maangchi’s blog that I follow on regular basis. She also has her own channel on YouTube. 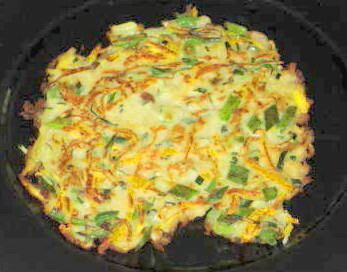 Julienne zucchini (matchstick size) and shred green onions. 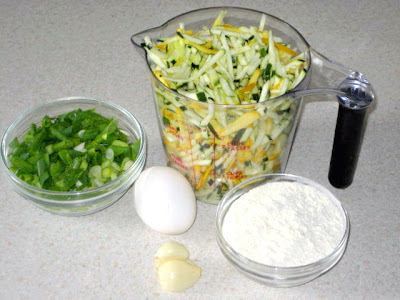 You should have about 2-1/2 cups of zucchini and 1/2 cup of green onions. In large mixing bowl beat the egg and then add salt, flour, pepper, garlic and water and mix until well combined and smooth. Add zucchini and onions and mix thoroughly with spatula. Heat 12” non-stick frying pan, add 1 Tbs. of oil and when hot add about 3/4 cup of pancake mixture. Spread it evenly, making fairly thin pancake. Press down with spatula to get even browning on bottom. Add some sesame oil around the edges to help the browning. When edges are golden brown, about 2 minutes, flip or turn over and cook another 2 minutes. Again, add 1 tsp. of sesame oil around the edges. Transfer to heated plate and keep warm while frying rest of the pancakes. I know that it is basically traditional Korean dish and is served with spicy sauce but I served it with sour cream and sliced strawberries. Nice contrast in texture and taste! Note: Do not let the frying pan get too hot or you end up with burned edges and raw center. umm! It looks so tasty! Let me twit about this!